Story blocks are built to help you visualize your content. In Prezi you can find a dozen of ready-to-use story blocks that are separated in groups. In them, you can find different maps, programs, timelines and even whiteboard/ blackboard that you can use for your presentation. How to add Story Blocks? 1. Go to the place, where you would like to insert a story block. How to edit Story Blocks? 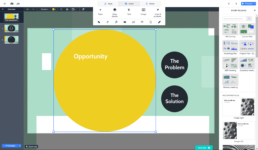 Once you added a story block to your presentation, just click on a placeholder and add your content on it. 1. Insert an image – If you choose a block which contains images, you can click on one and click Replace image on the menu above. 2. Rotate blocks – If you want to rotate a block, click on it to select it. Hold down CTRL + Alt (Windows) or COMMAND (Mac) and drag one of the corners of the box up or down to rotate it. Furthermore, in Story Blocks there is another section called Recommended. There you can find design ideas that the program suggests for you. You can get some ideas if you are wondering how to visualize your story blocks. Even more, they are very simple using only images that you can change later. 1. Choosing a layout: When you are choosing a layout you have to think about how many images you want to have, what you want to say with them, how much text you have, do you need an image for the background. After you have the answer you can easily choose the layout and just drag and drop it to the workplace and scale it. 2. Place with your content: After you place it to the right place, you can change the images with your own and place your text. Just click on the image with the right button on your mouse and choose Replace image. You can choose images by searching them (you have access to 500,000 images if you have to Prezi Edu Plus). The other option is to upload a file from your computer. Skipping slides in your presentation or going through a few of them very quickly disrupts the otherwise normal flow of your presentation.